This beautiful low mileage 1996 Porsche 993 C4S with a midnight blue metallic exterior and a classic grey leather interior has been very well cared for with service records going back to 2001 with 14,409 miles on the odometer at that time. Recent servicing performed on 3/16/16 includes, cam tower removal to clean secondary air passages, top end reseal, a major service and a new clutch. Just passed California smog.---Features:-* 3.6 Liter H6 Engine w/ Varioram. * Motor Sound Package. * 6-Speed Manual Transmission. * 8- Way Power Seat Drivers Side, 4- Way Power Seat Passenger Side. * Porsche Floor Mats Color Matching. * Rear Window Wiper.----Pre-purchase inspection report by our Porsche Factory trained technicians available to review.----Clean Title and Carfax. 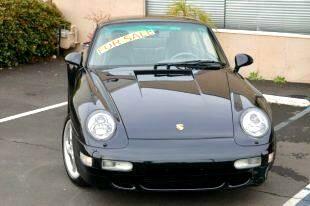 Message: Thought you might be interested in this 1996 Porsche 911.